Countless people — myself very much included — can't get through the day without regular intake of coffee, soda, and other caffeinated drinks. Now it turns out bees love the stuff too... and it's actually good for them. Plants typically use caffeine as a defense mechanism. In high enough quantities, caffeine is toxic to some insects, paralyzing and even killing pests that would feed on the plant. As a result, many plants secrete caffeine in their leaves, seeds, and fruit, all of which would otherwise be major targets for parasitic insects. What isn't so obvious is why plants secrete caffeine into their nectar, which is only consumed by bees, which are there to pollinate the plant and aid in their reproductive cycle. "Remembering floral traits is difficult for bees to perform at a fast pace as they fly from flower to flower and we have found that caffeine helps the bee remember where the flowers are. In turn, bees that have fed on caffeine-laced nectar are laden with coffee pollen and these bees search for other coffee plants to find more nectar, leading to better pollination. So, caffeine in nectar is likely to improve the bee's foraging prowess while providing the plant with a more faithful pollinator." Crucially, the plants have to ensure the bees don't consume too much caffeine, although purely for reasons of taste. Caffeine has an extremely bitter taste — as anyone who has drunk black coffee can readily confirm — that would repel bees, and so plants secrete just enough caffeine to trigger the memory boost, but not enough for the bees to actually taste the chemical. 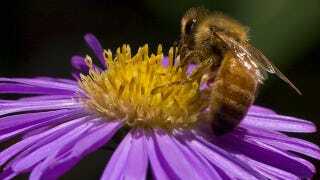 According to the study, bees were three times more likely to remember the location of a caffeinated flower after 24 hours compared to a regular one, and even three days the bees were still twice as likely to be able to relocate these particular plants. According to the researchers, there are enough similarities between bees and humans' brains for us to use bees as a model for the effects of caffeine in humans. Dr. Wright suggests that the memory benefits observed in bees might help explain why people tend to drink coffee when performing a memory-intensive task like studying. For more, check out the original paper at Science. Image by Red Barnes on Flickr.